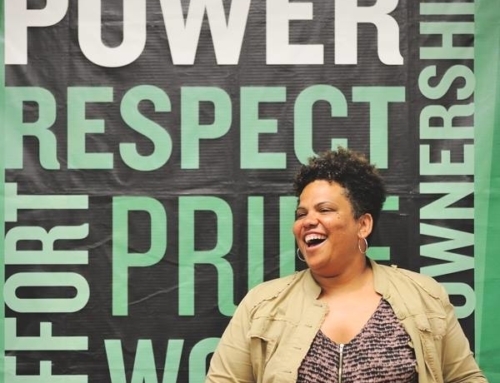 Around this time last year, Common Ground extended a warm welcome to the amazing Environmental Leader in Residence, Akiima Price. 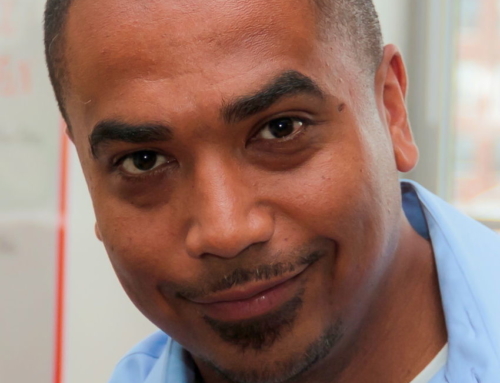 Akiima helped to expand Common Ground’s definition of environmental leadership, my senior project group’s goals, and my view of the lack of diversity and inclusiveness within environmental work. Akiima went so far to be a resource for any questions we had, along with describing the barriers and history of environmental discrimination. This experience allowed me to recognize the social aspect of environmentalism that I and others were missing when discussing environmentalism. 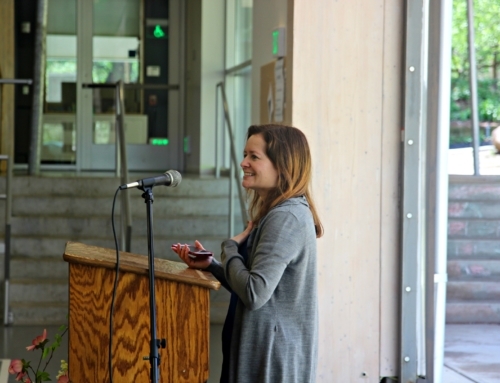 Leah Penniman — farmer, social justice activist, educator — speaks to all students at a POWER assembly. Photo Credit: Mel Morales. This year, we continued to grow as an inclusive, social, and environmental community and discover together as we extended an equally warm welcome our 3rd environmental leader in residence: Leah Penniman, founder of Soul Fire Farm and a full time high school science teacher. This year, Common Ground made a public call for nominations for our Leader in Residence, and considered nearly two dozen strong possibilities. Though many candidates met our requirements and interests, we felt that Leah was perfect for our community of students and educators. Charismatic, fun and even more intelligent and insightful were all things that came to mind whenever we spoke — which is something that’s important to our community. 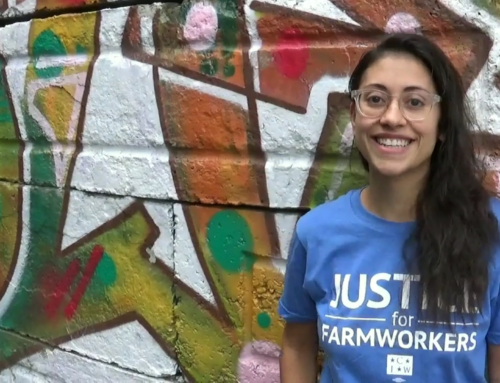 We looked to Leah to help us continue to make connections between the environment, agriculture, social justice, and equity. In the selection process I was glad to play a role of helping to review candidates to be selected. The selection process consisted of phone calls and interviews and background research of the possible candidates. Following these conversations a group of staff and other professionals along with me (an emerging environmental leader) would convene and discuss the strengths and weaknesses of our candidates. With so many candidates with great backgrounds, history, and projects the decision became difficult when looking at experience. It almost seemed like we were nit picking at times but when it came to the human aspect, I became instantly comfortable with Leah. This stood out to me because these were all people I’d never met before. In everything she did, there was passion and love for the work and the healing that was taking place. Leah spent a powerful and full week with us at Common Ground. Her experiences included discussions on how to make our curriculum more inclusive and relatable to the present cultures and races within our classrooms, direct classroom observation, and work with the Diversity Committee to discuss Common Ground’s potential for revolutionary change. And that was just the first day. Leah continued her valuable work by meeting with our farmers, joined our students of color who are working to increase inclusiveness and break down barriers for a lunch chat, led a POWER assembly for the entire school, attended a CitySeed potluck (which included puff pastry stuffed with saltfish to honor Leah’s Haitian heritage), participated in a learning exchange about social justice, and presented in faculty meeting. But the two experiences that I connected with most were saved for the end of the week. Nate Wilson speaking at the Earth Day Youth Summit at Hillhouse High School. Thursday Morning at 8am kicked off with our Annual City Wide Earth Day Youth Summit, a place for kids and young adults across New Haven and neighboring cities to convene in one space and present to each other. 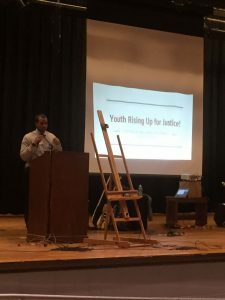 This year’s youth summit was held at Hillhouse High School Last year it was at Southern Connecticut State University; my Senior Project group and I presented our research findings, and work we were doing at Bethel AME Church of Goffe St in New Haven. This year, I changed roles: facilitating the event instead of presenting. Leah presented for us at Hillhouse — sharing stories of young people taking action for social and environmental justice, from organizing for criminal justice reform to calculating the impact of cutting a forest on climate change. After her presentation (along with a wonderful performance by the band The Matter, and presentations by students from Coop and Common Ground) we jumped into workshops that were being facilitated by students. The workshops were really varied: from how to safely interact with police with the recent unjust killings of minorities, to the pros and cons of nuclear power. From there, we had the chance to interact, career fair-style, with staff from organizations from Planned Parenthood, to the City-Wide Youth Coalition, to the U.S. Fish And Wildlife. That evening we began a night of fun and serious conversation, as EE (Environmental Education) organizations and professionals met at Common Ground for the opening night of the New England Environmental Education Association Leadership Summit. Joel Tolman (Common Ground), Michelle Eckman (Connecticut Outdoor & Environmental Education Association), and Adrian Ayson (NEEEA) shared the goal of the summit: opening up space for a new, more racially and economically diverse generation of environmental education leaders. To get the conversation started, Jesse Delia from Common Ground and I began a group activity that simply broke down people’s interpersonal barriers and didn’t give them the time to feel uncomfortable. Essentially it was a mingling game where you’d meet a new person and ask them questions made by the facilitators (us) to be answered within 30 seconds or so. Once the questions are answered you then swap questions and begin the process all over again. This activity lasted for 10-15 minutes. 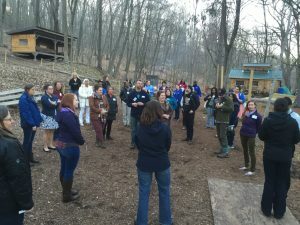 Environmental Educators from across New England gather in Common Ground’s outdoor classroom. Their common question: How do we need to change as individuals, organizations, and systems to support a new, more diverse generation of EE leaders? Then, we gathered around the campfire, and four of us shared fire starter stories to help ground and energize our work. Leah began. She didn’t bring a dry speech that lacked energy and was written 20 minutes before she spoke. 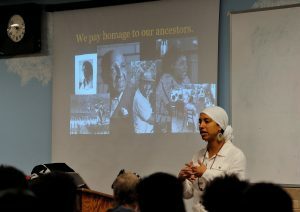 She had a story to tell of her Haitian ancestry and rooted history that had been left out of history books. It was lively and her passion danced rhythmically, synced with the flames of the campfire. Leah shared the advancements her peoples made in agriculture — many of the most important practices of organic, sustainable, regenerative agriculture today. When enslaved, they hid their valuable knowledge of cropping methods by weaving the seeds they’d harvest into their children’s braids. My story focused on how I became invested and interested in Environmental Education and Sociology, beginning with the start of my senior project. It was through this project that I learned about environmental discrimination, and how it rooted back to national parks being designed to be inaccessible to people of color, and how this discrimination continues to the present day land health of impoverished areas with the majority populations being people of color. After we shared stories as a whole group, we gathered in trios of speaker, listener, and holder to share our own firestarter stories. The stories went on late into the night and reflected generations of pain and inspiration, and conversations that couldn’t be held comfortably in an average space. For many it was a relief to be surrounded by so many like minded individuals and to be that comfortable so quickly. After a powerful night, Friday kicked off with this question: How do we need to change as individuals, organizations, and systems to support a new, more diverse generation of EE leaders? Coleen O’ Connell, a professor at Lesley University, shared a set of related questions in her keynote address on “Where has EE come from? What do we want to grow next?,” and Leah provided some potential answers from her work at Soul Fire Farm. This was how we jumped back into the second day of the NEEEA Leadership Summit. With these questions in mind we broke out into caucus groups based on age, experience, and positions within the environmental field. Leah led the youngest group of environmental leaders. I stayed in this group too because only a year ago I was doing things very similar to what the high schoolers in this group were doing. I offered them constructive criticism and advice –for instance, not to be afraid to speak up based on the fact that you have less experience. These were things I had trouble with and I’m still working on as an emerging leader and professional. Leah was very supportive throughout their process of creating lists of pros and cons they saw in their own organizations and in the EE field in general. We also recognized environmental social justice and health issues that different states and cities face–for example, the water crisis in Flint, Michigan. Other groups discussed how established leaders can welcome a younger and more inclusive generation of leaders, while also discussing authority and seasonal jobs and why they often don’t work well for people needs and the criteria of “change” according to funders and the government. We covered a wide range of issues more deeply than we originally were considering. It felt like the start of some long lasting conversations and hard work to reach solutions. The day continued with planning time in teams that brought together emerging and established leaders from environmental education organizations, and “open space” time to talk about big common challenges in our work. After a day and a half of work — and a full week with Leah — we gathered in a closing circle outside at Common Ground. I feel that it was the best possible “start” we could’ve hoped for, as this is not easy work. The week ended with organizations wanting to talk more and do more. A weight lifted, recognizing that those doing the work are not alone in a fight for inclusiveness. Curious to learn more? 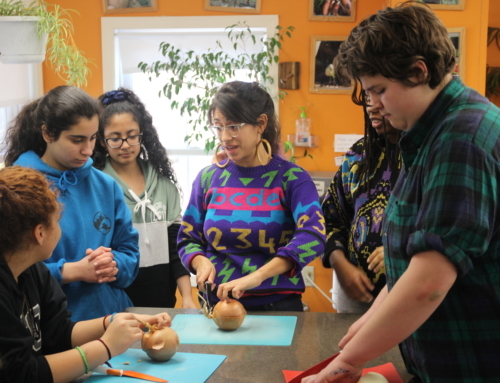 Read Leah’s reflections on her time at Common Ground, and a post about the residency.